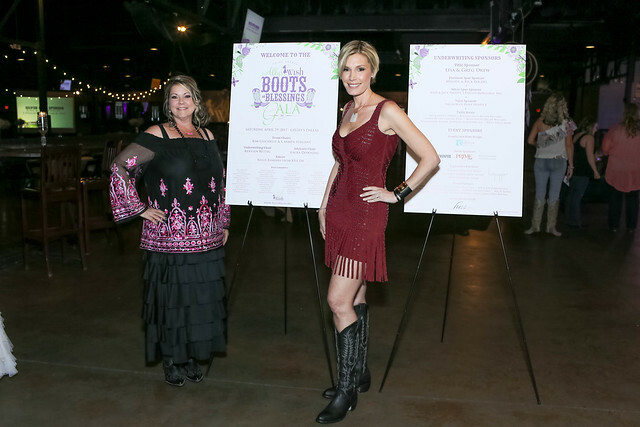 The Third Annual Boots & Blessings Gala presented by Lisa and Greg Drew took place on Saturday, April 29, 2017 at Gilley’s Dallas to benefit Ally’s Wish. The Flower Mound-based organization grants wishes such as trips to Disney World or helicopter rides over the Grand Canyon to mothers battling terminal illnesses so they may create lasting memories with their children and loved ones. “At Ally’s Wish they tell the terminally ill mothers they serve to ‘dream big, no matter what.’ We selected SHE DREAMS as the theme of this year’s event to inspire us as we raised dollars to help make those wishes come true” said event chairs, Kim Gilchrist and Carmen Surgent. Attendees kicked off the evening by perusing through an extensive silent auction filled with trips, fashion & accessories, sports memorabilia, restaurant and entertainment packages and more. A special “Wish Wall” featuring the stories & wishes of over 20 moms currently on the waiting list allowed guests to donate directly to granting a wish that touched their heart. A pop-up shop from Pratiksha Jewelry allowed shoppers to purchase fine jewelry on-site with a portion of proceeds being donated back to the charity. Guests enjoyed a boot shine from Cowboy Nation Boot Repair / Boot Shines by Gabby and make-up touchups were provided to the ladies courtesy of Blushington. In attendance were Dawn & Jon Mellon, Tricia Sims, Trammell Crow Hancock, Kersten Rettig & Clark Knippers, Chad Collom, Steve Kemble, Judy and Jack Philips, Karen Lukin, Shirley & Bill Cohn, and Maci Cozart. Radio host and TV personality Kellie Rasberry served as emcee for the evening and gathered everyone to their seats where the program began with a rousing game of Heads or Tails with the winner receiving a 2-night staycation courtesy of the Four Seasons Las Colinas. Phil Conner, led the room in prayer and blessed not only the meal, but prayed that guests would open up their hearts and wallets for the evening to support Ally’s Wish in their fundraising endeavors. Guests then enjoyed live Country-Western entertainment from The Breckenridge Band as they dined on a traditional BBQ fare. As the dinner hour wound down, Kellie Rasberry returned to the stage to invite the founders of Ally’s Wish to share the story of past moms and future moms. Immediately proceeding a video sharing the wish impact stories of current wish recipient Ayesha Boykin and the late Terran Spencer, Missy Phipps, President & co-founder, spoke about how three years ago, four friends founded Ally’s Wish in honor of their dear friend, Allyson Hendrickson. Allyson’s wish was the first to be granted prior to losing her battle with ovarian cancer in 2014. Hendrickson’s blog, 3 Little Cowboys began as a collection of letters and stories to her three young sons, but it quickly gained a national following spanning seven years. With her friends by her side, she unwrapped her published book, Three Little Cowboys. Today a portion of the sales from Hendrickson’s book benefits Ally’s Wish and the college funds of her three children. Phipps, along with fellow co-founders Melissa Cary and Holly Reed and board member Kelly Wolgamott, then read a moving poem titled, She Dreams. The poem spoke of the unfulfilled dreams of a mother who will lose her battle with a terminal illness and the things she will never get to experience with her children: teaching them to ride a bike or drive, watching them go to prom, helping them with homework, watching them graduate or plan a wedding and so many more life experiences that we take for granted. The evening concluded with line dancing instruction provided by The Breckenridge Band and as guests departed, they were treated to take home bags of flavored popcorn from Hot Poppin’. Since its inception, Ally’s Wish has granted fifty-six wishes to mothers who’ve battled inflammatory breast cancer, Leukemia, colon cancer and other terminal illnesses. Ally’s Wish currently has 27 moms waiting to have wishes granted with new requests arriving daily. Wish requests and nominations are accepted year-round and while based in North Texas, Ally’s Wish grants wishes to mothers across the U.S. The stories of the women who have been granted wishes and have touched countless lives along the way are featured on the Ally’s Wish website. To learn more about Ally’s Wish, please visit www.allyswish.org. Disclaimer: Ally's Wish is a client of Gangway Advertising so technically this could be considered a paid post. I'm just thrilled that I get to work with such an amazing organization who is changing lives and bringing happiness to families every day. What a blessing!